BRISBANE: Cricket can be a game of fine lines but England fans were irked that Moeen Ali was judged on the wrong side of a bulging one when the all-rounder was stumped on day four of the series-opening Ashes test on Sunday. 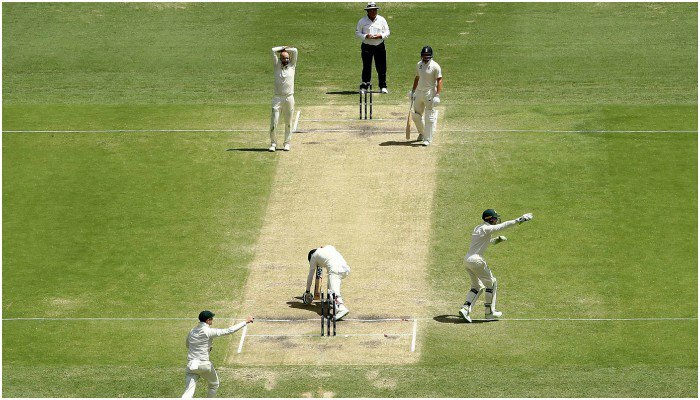 Battling with Jonny Bairstow to push his team to a respectable total, Moeen’s back foot strayed forward as he played and missed at a ball from spinner Nathan Lyon, with wicketkeeper Tim Paine sharply whipping off the bails. The decision was referred upstairs and after lengthy deliberation using an array of angles, the third umpire Chris Gaffaney of New Zealand gave Moeen out for 40, with no clear evidence that the player’s foot was behind the line. While it appeared a marginal decision, there was no benefit of the doubt given and English fans at the Gabba greeted the dismissal with jeers as their team slumped to 155 for six. England then lost their last wickets for 40 runs to be out for 195 before Australia openers David Warner and Cameron Bancroft pushed their team to 114 without loss, and needing only 56 runs for victory. England’s ‘Barmy Army’ and a host of media pundits queried the integrity of the line on social media, as it did appear to be slightly wider at the middle of the pitch than at the edges. The decision was quickly dubbed ‘Shoddy-line’, ‘Bulge-gate’ and other epithets but Moeen, himself, was loath to question it. “If I was bowling, I would want it out,” quipped the bearded all-rounder. ”I guess it depends what angle you look at it from. You’ve got to respect umpires call and what he saw. “You’ve just got to move on. I thought I was alright personally, but the replay did look very tight,” he added. ”Obviously disappointed with myself that I got out in that fashion.